Although Easter is to many a celebration of the resurrection of Jesus, the Easter bunny has become a ubiquitous symbol of the holiday. Some believe the origins of the bunny harken back to pre-Christian Anglo-Saxon history, when pagans celebrated a festival honoring the goddess Eostre, whose animal symbol was a bunny rabbit. Others disagree and believe the rabbit is tied to the Virgin Mary and her miraculous pregnancy. In the medieval period, rabbits started to appear in illuminated manuscripts and paintings of the Virgin Mary, as symbols of fertility. Regardless of its ancient origin, historians believe the tradition of the Easter bunny was brought to America by German immigrants who settled in Pennsylvania in the 1700s. Today, Easter is a popular secular holiday in the U.S., in part because of the fun activities associated with it. 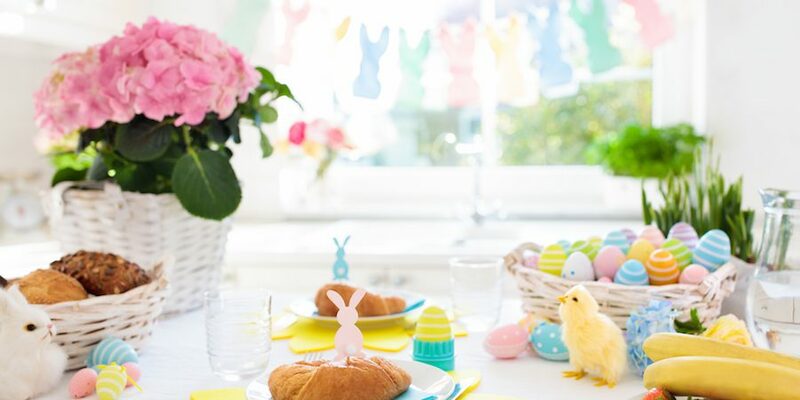 In addition to Easter bunnies doling out candy to children, Easter egg hunts, and coloring real eggs, many people love to display decorations for Easter inside and outside their homes. While gifting candy is a delicious Easter tradition, a wonderful way to celebrate the holiday is to give loved ones and dear friends beautiful and unique presents they can cherish for many Easters to come. Here are a few bunny-related gifts to make Easter truly memorable. 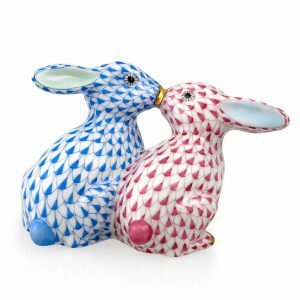 Herend Kissing Bunnies: While every Herend bunny in our collection is exceptional, we think this pair of kissing bunnies is divinely delightful. Handmade in Hungary by the famed porcelain maker, these bunnies are embellished with 24kt gold accents and available in many lovely color combinations. This Scully & Scully exclusive is a truly spectacular gift they’ll cherish forever. 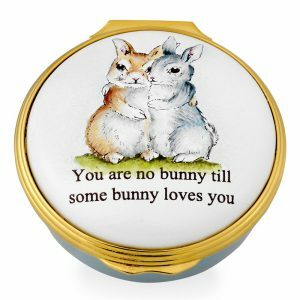 Halcyon Days You Are No Bunny Enamel Box: Made in England, this charming little hand-enameled box will please the most discerning connoisseur collector. With meticulously depicted fluffy bunnies and 24kt gold plated fittings, this artisan box makes a marvelous Easter gift they will want to use every day of the year. Pewter Easter Garden: Honor the age-old tradition of Germans bringing Easter bunnies to America with playful hand-painted bunny rabbits celebrating the holiday in style. Handcast in engraved molds, these imaginative pieces are entirely handmade by one family in Germany since 1796! They’ll add a creative and colorful touch to any indoor Easter display.